Last Saturday was the annual UK Festival of Zombie Culture held at the Phoenix Arts Centre in Leicester. The event is now in its ninth year and is the fourth year I have attended. My report on 2013 and 2014 can be found clicking on the links. After bailing on the final film at last years event I felt I had something to prove to myself this time around and so was determined to make it all the way to the end.. It can and does get tiring watching 13 hours of films, my method of coping last year was alcohol but that was a fail, this year my secret weapon was energy drinks. Arriving at the venue pretty much spot on for midday I passed the organiser; Zombie Ed being interviewed by the local news and headed into the first showing. Previously I had got a 'goodie' bag for being one of the first 200 through the doors, not this year, though seeing as it usually consists of leaflets and old copies of Shock Horror magazine I wasn't too fussed. 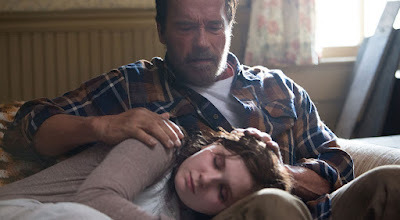 The first film was Maggie (starring Arnold Schwarzenegger), I had seen this earlier in the year and had thought it was ok if a little slow paced, and my opinion did not change watching it again. I think many had expected an action packed romp rather than a touching story about a father and his daughter and so didn't enjoy it. I spoke to some people later in the day and they all seemed to share the opinion that it was awful. After this film I went to do my yearly attempt at the Dead Rising 2 video game challenge in which you get 3 minutes to try and kill as many zombies as possible. I always do depressingly average and so even the reveal that there would now be prizes for the very humorously worst players too didn't excite. As expected I towed the median line, though my friend received a bunch of prizes for her effort. Both of us have no excuse for being so bad as we both own the damn game! The second film of the event was Nightmare City; an Italian classic from the hey-day of Italian zombie films and one I had never heard of until it was announced for this year. It was just as completely terrible as I had hoped with amazingly bad special effects and lots of craziness that led to a really fun view. With Nightmare City just a distant dream I used the break between films to go talk to horror author Adam Millard, he's always at this event and always seems really nice, this year I was determined I would actually buy a book of his, so that I did getting a copy of Larry. I have to say the covers for all his books look fantastic. Third film was the Brighton based Darkest Day, this one I had pretty low expectations for. With a budget of under £1000 and filmed over an eight year period this should be awful but I was actually pretty much blown away by the level of skill used in the visual effects and the fact that the acting was really not that bad. The directer (Dan Rickard) was in the audience and after the showing he and his producer held a really interesting Q and A.
Halfway through and with the energy drink running through my veins I felt quite awake, I went and spoke to the other horror author in attendance; Duncan P. Bradshaw and brought Book of Ishtar that combines both his novels Class Three and Class Four; just like Adam Millard he was so friendly, so it was a pleasure to talk to him. An hour later after dinner and short comedy piece Merlin Archery Adventures and the next film was due to start; Australian comedy Me and My Mates vs. The Zombie Apocalypse. This starred comedians Jim Jeffries, Greg Fleet and Alex Williamson. It was the UK premiere for this film and the crowd seemed to really love it. For me I did not like any of the characters too much yet the script was for the most part hilarious and said with perfect timing by the actors, certainly the funniest film shown here. I will add here that as well as the usual assortment of zombie video games available to play (House of the Dead II etc) there was also what I assume was a boot leg copy of Sonic that was a creepy version that I had thought existed only in a Creepy Pasta. The game runs normally but every now and again static fills the screen and the graphics go all dark and moody, looked awesome but I never got around to playing it. I started drinking at this point figuring it was late enough in the day that it wouldn't affect my concentration and I was feeling pretty exhausted. Fifth film was the American comedy horror Cooties which I had heard great things about. It stars Elijah Woods and Rainn Wilson (Dwight from American The Office) and has them as teachers trying to survive a zombie outbreak at their school that only affects children. It was really funny and the kids all came across as super creepy, lots of inappropriate violence against children which was hilarious, but overall it didn't completely blow me away. I was knackered by this point and unsure about what the final film would even be. This year a choice of four was given in the lead up to the event with a poll used to decide which would be shown. 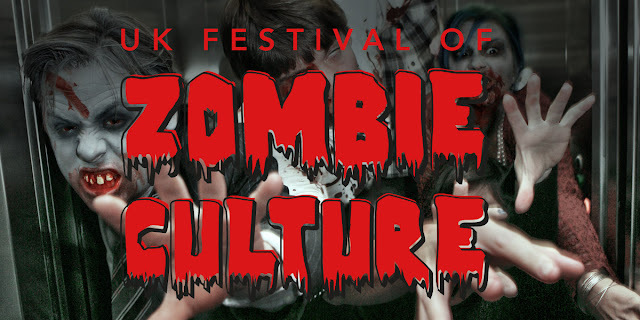 The four choices were Amigo Undead, Night of the Living Deb, Let There Be Zombies, and Fallen Soldiers none of which really appealed to me based on the poor trailers. I ended up voting for Let There Be Zombies mainly because I had previously covered it in a news post. 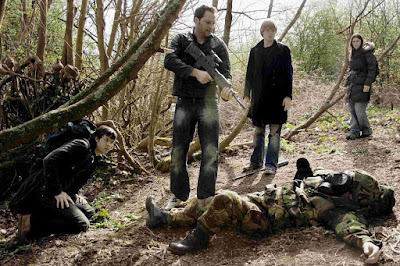 As it was the chosen film Fallen Soldiers; a zombie film set in 1800's France was shown, and one which I found to be quite dull and poorly made. Not a patch on last years Exit Humanity that was set in the same century and so much better. Zombie Ed introducing this final film didn't seem particularly enthused about any of the four choices either. While this year there were no stand out films (previous years have included Gangsters, Guns and Zombies, The Battery, and Exit Humanity) I still feel this was the best year in terms of sheer enjoyment. Each year I get more comfortable and recognise more people from previous years, Zombie Ed does a fantastic job and is very entertaining, though the event was not sold out this year as there seemed a few empty seats which was a shame. It was a totally fantastic time, I left very excited for 2016's one! To finish I will mention that due to the energy drinks I had been drinking all day I was pretty much unable to sleep at all that night and felt like my heart was going to explode, but a small price to pay for having such an awesome day!